Visa Logistics makes the process of obtaining your abridged or unabridged South African marriage certificate faster and more hassle free. You can attempt to apply for the Unabridged Marriage Certificate directly at Home Affairs, but this can take up to 8 weeks from the date of application. And let’s not forget the time taken to stand in the queue, fill in the correct forms and taking off time from work to do so. We help and assist all South African citizens, local or abroad by providing a quick and 100% genuine Unabridged Marriage Certificate Service. 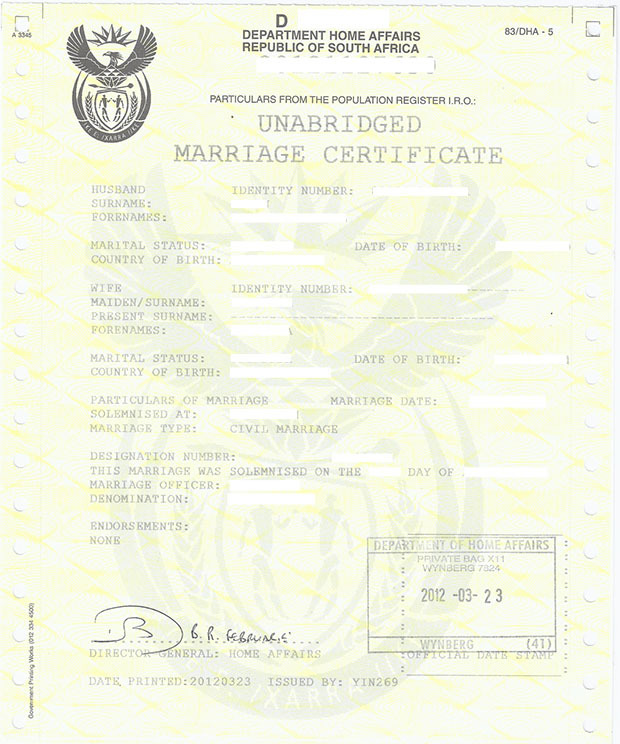 How do you apply for an unabridged marriage certificate? When you get married in South Africa, you’ll be issued with a handwritten marriage certificate on the day of your wedding at no cost, by the marriage officer. It is advisable to apply for your unabridged certificate from the Department of Home Affairs soon as possible, as all marriages are registered at the Department. Soon after your wedding an Abridged Typed Marriage Certificate, issued by Home Affairs will be sent to you. This Abridged Marriage Certificate will contain both your personal details such as full name and ID number as well as the date of the marriage. It is sufficient for couples who are living in South Africa, as proof of marital status, and it will be accepted in certain countries abroad with an apostille/authentication. An unabridged certificate, also known as a full marriage certificate, contains more detailed information about both spouses, in addition to verifying that the nuptials are permissible and also documenting that the marriage has been witnessed by eligible spectators. This formal certificate is generally required if you plan to travel extensively, emigrate or obtain a foreign passport. If one or both spouses are not South African, an unabridged marriage certificate will be required to register the marriage their home countries.